Martha Payne was told by a local council to stop uploading pictures of her school meals to her blog. 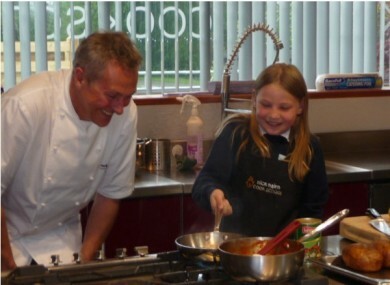 Martha with chef Nick Nairn last week. A NINE-YEAR-OLD blogger has raised more than £67,000 for charity and gained almost five million hits on her website after a local council blocked her from taking photographs of her school meals. Martha Payne, known as VEG on her blog NeverSeconds, was asked by her school to stop uploading photos and ratings of her lunches after the council contacted them about a local newspaper headline. The young schoolgirl had started the blog as a writing project – and for fun – but soon realised she could use it to raise money for Mary’s Meals, a school dinners initiative in Malawi. She had hoped to raise enough for a kitchen and was “disappointed” and “worried” that she would “never reach enough money” when the Argyll and Bute Council issued its ban. When authorities stopped her from posting photos, her fundraising total was only £2,000 but after the Internet outcry over the ban, it has since jumped to almost £70,000. The council said its initial ban was implemented because staff at the school canteen became concerned about their jobs when a local newspaper carried an “inaccurate and abusive” report. “That, of course, was not the fault of the blog, but of the paper,” said local councillor Roddy McCuish. Describing Martha as an “enterprising and imaginative pupil”, McCuish said he would be meeting with her and her father as soon as possible. Martha herself thanked everyone for getting her blog “back on track”. The NeverSeconds blog was started in April this year and every entry has a picture of Martha’s daily lunch and a list of ratings, including ‘food-o-meter’, health, price and number of courses. After becoming popular with other foodies, she also started to include pictures from other bloggers who sent her images of their own lunches from that day. Email “Nine-year-old raises almost £70,000 after council banned her blog”. Feedback on “Nine-year-old raises almost £70,000 after council banned her blog”.